For my second installment of the Founder to CEO series, I’m very pleased to share my conversations with Tobi from Shopify. 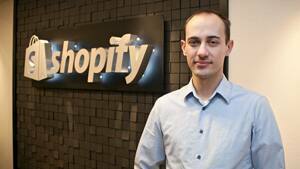 I have had the pleasure of working with Tobi and the Shopify team in the past. They are building a truly special, market-leading company. Tobi comes to Canada from Germany. Before co-founding Shopify, Tobi was active in many open source projects. The best known of which is the Ruby on Rails framework where Tobi served as a core team member. As you will learn from this post, Tobi is probably the most brilliant high school dropout you will ever meet. Like many of us, Tobi learns by trying. He had “trouble” in school but computers fascinated him early. He learned arbitrage in order to earn money to buy computers. He was still in Germany at the time and was able to do co-op work terms instead of spending time in the classroom. His interest in retail was sparked at one of those early co-op terms. Tobi likes programming for “artistic purposes”. Just for the sake of it. He and his partners started an online snowboard store that became Shopify “just to create a good job for myself”. Tobi was not the first CEO at Shopify. By his own admission he had paid no attention to the business side of things before his original co-founder left. Even after he left, Tobi’s first reaction was to find a replacement CEO. But, even in those early days Tobi knew he wanted to build a product and tech-centric company. In addition, he knew that ‘the person who runs the product should run the business’. Ignorance is bliss: According to Tobi: “Ignorance is the single biggest driver of entrepreneurship. It was two years before it ever occurred to me that this might not work”. Self-awareness and introspection are key: Tobi has always had this. “I perceive my days as if there is a camera behind me. I can replay my day and learn from it”. “Introspection is all you’ve got. You’re not going to get a lot of feedback as CEO”. If, like most startup entrepreneurs you’re mind is always going, Tobi recommends meditation to help train your mind for introspection. (I completely agree with him!). As CEO of a growing market leader Tobi lives in the future. He always has to be thinking years ahead. If he talks to his team about what he’s thinking about he can defocus them. It is a great discipline and insight to realize this. Human nature will make us want to work on what the CEO is thinking about. This does not mean Tobi doesn’t share his future plans, but it does mean he is careful about not defocusing the team from short term execution. It takes a village: There is a strong ecosystem around Tobi: An early angel investor continues to play a strong mentorship role. Benchmark’s Peter Fenton helped him put together his 1st investor deck (great when you consider that Tobi never took money from him). Tobi thinks everyone that is serious about their performance should have a coach. He and most of his exec team have one. “When you are the CEO, you never get to blame anyone ever again”. Everything that goes wrong is your fault. Tobi likes Oscar Wilde’s approach: “Be yourself. Every other personality is taken”. Design the CEO role around your strengths and passions. “Companies are manifestations of their founders. “Shopify is good at all the things I am good at and bad at all the things I am bad at”. Don’t try and be someone else. Be yourself. Advice to CEOs: Build for a problem that you have. “This allows you to do high bandwidth customer development with yourself giving you an unfair advantage”. 30 day trial: Tobi frames all new things as a trial makes it easy to try and fail. If it’s a formal initiative there is more pressure for it to work. This removes the risk. That way you don’t look flimsy if something you introduced goes away. Weekly accountability: Tobi gets a list of key accomplishments and planned objectives every Monday from his team members. This makes it easy for him to know what to talk to his team about. Don’t do “top down” process. “Only the people who use a process are allowed to come up with a process”. It should not be imposed from above. Perspective: “I truly care about macro and micro things but nothing in between. I can zoom in on tiny details and zoom out to big vision.” Tobi is a lot like Mark Zuckerberg in this respect. All great CEOs must be able to context shift in this way. Weekends / offsites are better for working ON the business (because you’re not IN it). Be special: Admittedly it takes resources to do some of the things that Shopify does but from their office to their perks that include free housekeeping they are focused on creating a special experience for their team members. “Speaking to VCs was one of the best ways to learn about my business”. As an introvert Tobi has learned to “act extrovert”. “Learning to act is a tremendously useful skill but it takes its toll. I have to unplug to recharge myself”. It will come as no surprise that Tobi and his team have thought a lot about culture. It’s so important that one of the founders, Daniel, has assumed the role of Chief Culture Officer. So, what is culture mean at Shopify? – No one “owns” something internally. “We all own everything that everyone else made”. Everyone is empowered to fix something that is broken. Does not matter who made it. – Complete transparency: Tobi’s the first to admit if he does not understand something. Begin with the end in mind: Tobi’s approach is to always have the best tools for the job in order to make the job simple. The Shopify team took a year to change Rails to make it “perfect for Shopify.” “Make the right thing easy. This is a metaphor for building businesses that work well” This approach to building his company comes right from the rails framework. Performance is not about winning. “There are only two kinds of teams: ones that get better every day and ones that get worse”. “We have to get better on average every day. If we do this every day eventually we will be unstoppable.” This thinking leads you to get a coach. “You’d be crazy to go without one”. “Don’t read too much. Ignorance is so important”.